We at Elle Dee bring to you the festive yule log cake, just in time for the holidays. Have a look at the video below to watch our lovely Lisa, one of the best in the business, make our cake! Cake is the sweetest way to demonstrate love, friendship, and warmth. The best way to share happiness. The cake became fashionable in Paris during the 1870’s with the rise of café culture where society ladies indulged their sweet tooth on delicacies; from flavorful macarons to rich, oozing chocolate tarts. The period heralded the rise of a new class of baker and pastry chef that soon spread around the world. Today, Toronto is lucky to boast its own talented team of specialist bakers and cake artists at Elle Dee who have been lovingly creating fun and fabulously delicious cakes for over a decade. 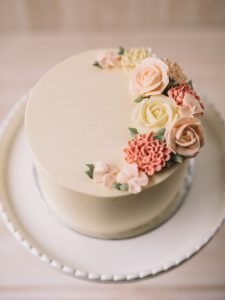 Founded by sisters Lisa and Joy, the Elle Dee team is a blend of highly skilled cake designers, sculptors and artists who are world renowned for their creativity and their ability to apply their own unique twist to every cake. 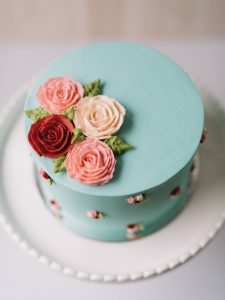 Elle Dee crafts bespoke and beautiful cake creations to order for Toronto’s society occasions in addition to their very popular ‘Signature Collection’, available in Pusateri’s and on our website. The Elle Dee ‘Signature Collection’ is based on the team’s experience of the most popular flavours, ingredients and cake trends such as their Crescent Rose Cake, Chocolate Drip and Perfect Disaster Cake. Whatever the occasion, from a wedding to a lavish birthday party, an Elle Dee cake is a unique gift guaranteed to surprise and delight. Other fashionable cake-giving occasions include a stunning dinner party centrepiece, baby shower, Bar Mitzvah, an anniversary, Christmas, a bespoke gift for the person who has everything, a surprise gesture for a best friend or as a thoughtful thank you… the list is endless. Talk to the Elle Dee team about your own occasion or idea. Their experience and creativity will deliver a stunning design that both you and your recipient will adore.